The Beach race is a open class race, which means boards of the 12'6, 14' and open class will be accepted. During the race there will be a course laid out (depending of the conditions of the day) , the course has to be paddled at least 2x and each time followed by a part where contestants will be running a part over the beach. The run part over the beach has to be done with the paddle in hand, before that, the board has to be secured on the beach, meaning it has to be put on dry land and not be floating in beach water. The beach run "course" will be in such way that you end where you started the run and will be picking up the board on the way back into the water. The course is around all buoys as directed by the beachmaster, at no time may a competitor impede another competitor. Unsportsmanlike conduct/actions will result in disqualification of the event. Any contestant failing to round all buoys will be disqualified from the race. In case you fall off your board you have 5 strokes to stand back on your feet on the board. In case there is protest, it must be filed within 15 minutes of the end of the race to the beach master or ISUP.be official. Before the race there will be a "skippers"meeting, which has to be attended to by all competitors and where the course be explained, the rules and where questions may be asked and will be answered. The wave SUP competition will take place in heats and be judged by a jury ( see further down on way of judging ) . Each heat will be 30 min max, and SUP'ers are only permitted to catch a max of 15 waves per heat ,if more waves where ridden the best 15 will count towards the end result . Wave SUP competition is open to all board classes. Good SUP transition time [end of one wave to paddle-in to next one] should be spent standing and paddling with good technique and stable wave negotiation. 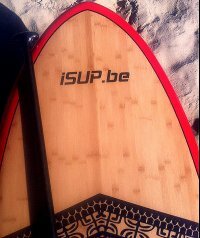 Kneeling, lying or sitting whilst paddling, unless necessary for safety is regarded as bad SUP form. Note the critical element: To the best of a rider’s ability he / she is expected to stand up on the board at all times throughout the heat, unless the situation of safety dictates otherwise. Entry into the wave should be by paddling in the standing position to enable the maximum score. Surfing - average scores for all maneuvers will be allocated unless the paddle is used as a pivot or tool in maneuvers, then power, radical moves, critical sections and degree of difficulty are the deciding factors. Competitors will start from the beach unless instructed otherwise by the beachmaster. “Using the paddle”: The paddle is correctly used in SUP surfing to do three main things: it is used in turns as a brace, a pivot, and a force multiplier. A surfer will be scored higher when he uses the paddle in some or all of these three ways to achieve sharper or more powerful turns. Tricks such as twirling or otherwise using the paddle in a non-functional manner will earn little or no extra score for the surfer. Traditional long board surfing compared to progressive SUP surfing techniques: Because the paddle allows large SUP boards to be turned with high rates of speed and power, stand-up paddle surfing is deemed to be, at the competition level, a performance-centered branch of surfing, much like conventional shortboarding. Footwork, nose riding and style points will be scored, but this will be done in their relationship to the criteria of degree of difficulty and critical nature of wave positioning. If a rider cannot sustain the standing position throughout the heat [in transition and surfing], this will be regarded in the same manner as improper use of the paddle and judges will only allocate average scores to his / her performances at best. Right of way- The surfer closest to the curl or at the center of peak has unconditional right of way or claim to that wave once he/she has paddled into and initiated a turn in chosen direction or dominant angle of the break or wave from that position. Interference Rule- Other surfers may not interfere with the surfer who has Right of way. An offending surfer will be penalized with interference call if the majority of the judges deem that the Right of way surfer’s scoring potential was hindered by the presence of offender on the wave or creating hindering of scoring situation by breaking down a section that the Right of way surfer would have made or used as scoring potential. - Surfers can ride the same wave in same or separate directions and still not hinder each other, interference will only be called if there is hindrance of scoring potential on the surfer who has been deemed to have Right of way as stated above. Interference Penalty- The offending surfer will be penalized by a 50% reduction in points on his second highest scoring ride at the completion of the heat which will count for heat point total. ‘Oceanmanship’: riders should show good etiquette in the water: ie yielding to the surfer with Right of way, respecting and watching out for fellow competitors, especially when conditions are challenging. Commitment and Degree of Difficulty Speed, Power and Flow, Innovative and Progressive Maneuvers, Combination of Major Maneuvers, Load bearing turns, Variety of Maneuvers. In the event of protest, it has to be filed within 10 minutes of the end of the heat to the beachmaster or a ISUP.be official. On the both the BEACH RACE and the WAVE SUP COMPETITION and the whole event for that matter we aim for a safe, friendly and aloha spirit ! Lets have a fantastic competion everybody will remember for years to come!! !